Located in the heart of Ribeira Brava in the centre of the island, Pensão Bela Sombra is a strikingly bright property, surrounded by breathtaking mountain scenery. You can explore São Nicolau from your doorstep, heading deep into the valley within a 15-minute walk. This is a good value, simple pension where English speaking may be limited as well as reception opening hours. São Nicolau’s landscape is very diverse, varying from one side of the island to the other. Make sure you don’t miss Carberinho, Monte Gordo and the Valley of Ribeira Prata. A strikingly bright property that perfectly encapsulates the vibrancy of Cape Verde, you’ll encounter Pensão Bela Sombra in the heart of Ribeira Brava, right in the centre of the island of São Nicolau. Such is the convenience of Bela Sombra’s location, guests will find themselves on the doorstep of both the island’s intriguing capital and the stunning mountainous landscapes that make São Nicolau so breathtakingly beautiful. The property itself can be found along one of the town’s narrow winding streets, standing out due to its bright pink and purple façade. 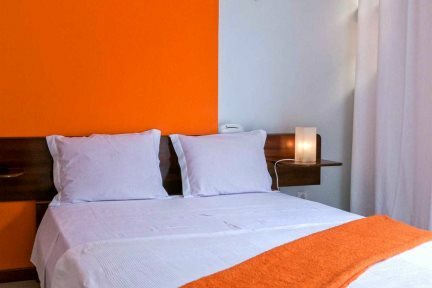 The vibrant colours provide a theme throughout the hotel, with the 18 simple but well-presented guest rooms offering a comfortable base for your stay. Views from the top floor balcony are superb, presenting the lush green mountains and the promise of adventure! The mountains will present a mainstay of your time at Bela Sombre, and with some great walking routes and guided walking tours on offer, you’ll find that Bela Sombra is ideal for getting out to explore the island. In the evenings, guests will be drawn to the superb Cape Verdean cuisine on offer when eating out in the small town. Your international flights are direct to Sal, then internal flights to/from São Nicolau. São Nicolau is best experienced as part of a multi-centre island hopping holiday around the archipelago with a stay of two or three nights. We can tailor-make an itinerary that includes a stay on São Nicolau . Visit our Island Hopping Holiday Ideas, or call one of our experts about a tailormade itinerary. Travelling time between Sal and São Nicolau is via Santiago and approximately 85 minutes' flying time. These rooms have double or twin beds with a balcony.